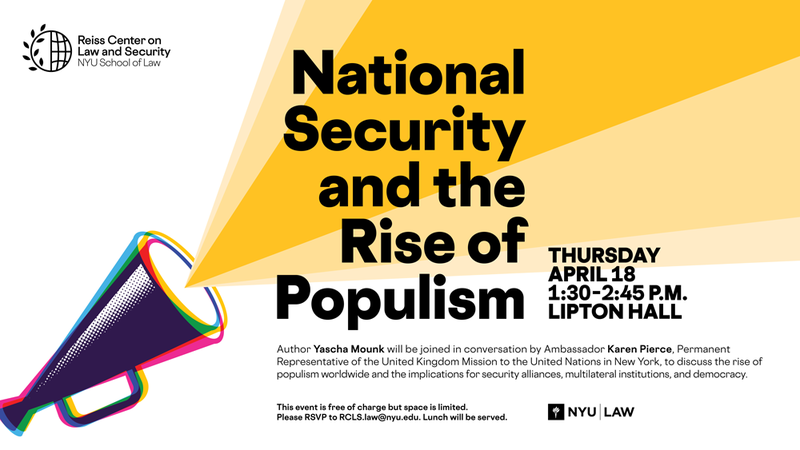 Thank you for joining us at the inaugural conversation of a Reiss Center discussion series on the rise of populism, led by RCLS fellow and acclaimed author and commentator Yascha Mounk (@Yascha_Mounk). 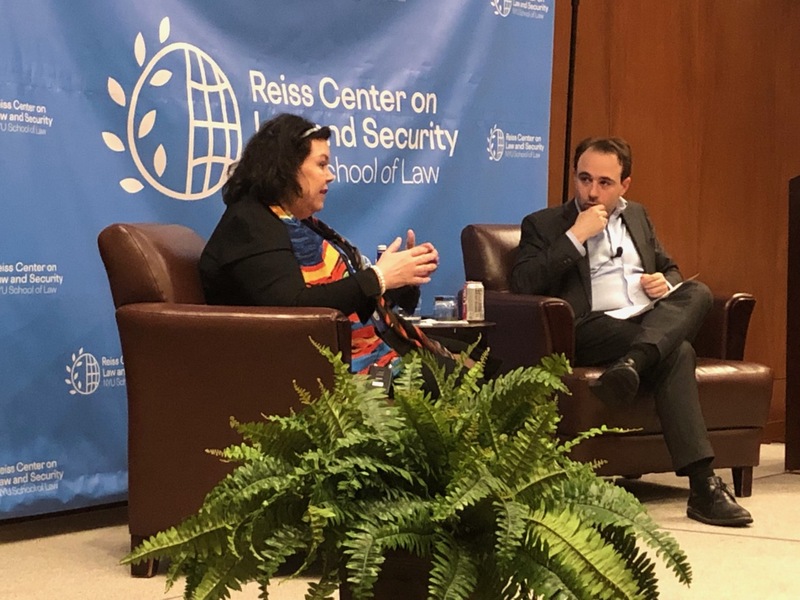 Mounk was joined by our featured speaker, Ambassador Karen Pierce, DCMG, UK Permanent Representative to the United Nations, for a wide-ranging conversation on the implications of growing populism and authoritarianism for longstanding alliances and multilateral organizations. They addressed the UK, European and transatlantic experience, and explored broader observations on the state of democracy and security in our current moment. Karen Pierce took up the position of the United Kingdom’s Permanent Representative to the United Nations in New York in March 2018. Prior to her appointment, Pierce served as the Director General for Political Affairs and Chief Operating Officer of the Foreign and Commonwealth in London, from 2016. Pierce joined the FCO in 1981. Her first position was in Tokyo between 1984 and 1987, after which she returned to the UK to work in the Security Policy Department. Pierce then worked in Washington as the Private Secretary to the British Ambassador to the United States between 1992 and 1995. Between 1996 and 2006, Pierce held several positions in London including Team Leader for Ukraine, Belarus and Moldova, Deputy Head of Eastern Adriatic (Balkans) Department, Head of Newsroom, Head of EU Department (Bilateral) and concurrently Head of Afghanistan Political Military Unit after 9/11 before returning to the Balkans as Balkans Coordinator from 2002 to 2006. In 2006, Pierce moved to New York for the first time to be the Deputy Permanent Representative and Ambassador at the UK Mission to the UN. In 2009, she moved back to London to become the Director of South Asia and Afghanistan Department and the UK’s Special Representative for Afghanistan and Pakistan. In 2012, Pierce started her second multilateral posting, this time in Geneva, where she was the Ambassador and Permanent Representative to the UK Mission to the UN, WTO and Other International Organisations until 2015. Between 2015 and 2016, Pierce was the UK’s Ambassador to Afghanistan. Yascha Mounk is a Non-Resident Senior Fellow at the Reiss Center on Law and Security at NYU School of Law. Mounk is one of the world’s leading experts on the rise of populism and the crisis of liberal democracy. Mounk is an Associate Professor of the Practice of International Affairs at Johns Hopkins University, a Contributing Editor at The Atlantic, and the host of The Good Fight podcast. His latest book, The People vs. Democracy: Why Our Freedom is in Danger and How To Save It, explains the causes of the populist rise and investigates how to renew liberal democracy. It has been translated into ten languages, and was hailed as one of 2018’s Best Books of the Year by multiple publications, including the Financial Times.